Growing older doesn’t mean a senior has to lose touch with his or her youth. Studies have even shown feeling younger can increase life expectancy. 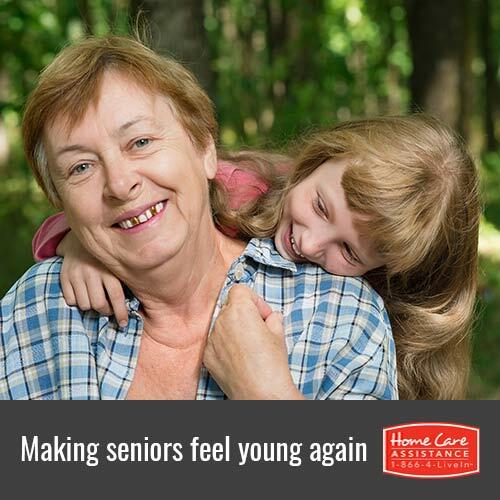 Here are some great ways to help your senior loved one recapture those youthful feelings, brought to you by the senior care experts at Harrisburg Home Care Assistance. Retaining mobility is important as seniors get older, and taking a dance class is a fun way to stay active and youthful. Try to find a community center offering tango or waltz classes for seniors. Dancing might remind your loved one of his or her youthful days and also provide an opportunity for socialization. The physical health benefits are an added bonus. Keeping the brain sharp can also help your loved one feel young. In fact, studies show maintaining a youthful brain can stave off cognitive conditions such as Alzheimer’s and dementia. Playing games like Sudoku, crossword puzzles, and chess can increase mental acuity and engagement. You can play the games together, buy the materials so your loved one can play them independently, or consider hiring a Harrisburg caregiver to keep him or her mentally stimulated. Participation in social activities may be more common when we are young, but seniors can revitalize their youth by staying social. Investigate local community centers and find classes and social activities that might interest your loved one. Most communities offer a wide variety of activities to keep seniors feeling young and vital, such as art lessons, philately clubs, and bird watching expeditions. These activities can be a great way for your loved one to make new friends and keep his or her mind engaged. One of the best ways to feel young is to stay physically healthy. Help your loved one create a diet and exercise regimen that is approved by a doctor and tailored to his or her needs. Many healthy foods have anti-inflammatory properties, which is great for seniors with joint pain who want to be more active. Let your loved one indulge in a few healthy fats like omega-3 fatty acids on occasion because they have mood-boosting properties that can help your loved one feel energized. Youth is in the eye of the beholder. Keep your loved one feeling young by helping him or her shop for new clothes and accessories and creating a new look. Older women may enjoy going to the makeup counter of a department store and trying on a new lipstick, and older men may enjoy buying a stylish hat or pair of shoes. A fresh look can go a long way toward making your loved one feel youthful and comfortable in his or her skin. Having a consistent companion to encourage activities like the above can also help your loved one stay young and healthy. At Home Care Assistance, our caregivers can help with exercise, nutritious meal prep, mental and social stimulation, and much more. For seniors who need more extensive assistance, we also offer comprehensive Alzheimer’s, stroke, and Parkinson’s care in Harrisburg. To learn more about how our senior care services can help your loved one stay happy and healthy, call one of our friendly Care Managers at (717) 540-4663 today.